Julia Abad heads the Presidential Management Staff at the Office of the President of the Republic of the Philippines. She is currently the youngest member of President Benigno S. Aquino III’s cabinet, managing a 300-person team that provides policy analysis, research and technical support to the Office of the President. Prior to her stint in government, Julia worked as an educator, lecturing in political science and helping to develop a citizenship curriculum for young children. She holds a Master’s Degree in Public Policy from the Harvard Kennedy School, which she attended as a Fulbright scholar. 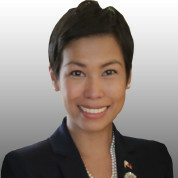 She was recognized by devex.com as one of Manila’s 40 under 40 International Development Leaders in 2012 and has been a member of the World Economic Forum’s Young Global Leaders’ community since 2014. Julia is passionate about encouraging young people to be aware of and involved in their communities.